What's your No. 1 fun trampoline accessory? When you invest in the fun of a trampoline and its accessories, you want to get the most mileage you can on your budget. While a trampoline is an investment for your kids’ whole childhood, you may initially only want to—or can only—get a single accessory to go with it. So, which do you choose? Think about how much time the kids will spend playing with the accessory. Alternatively, how much value—for a utility accessory—will you get from frequently using it? Vuly has a stack of exciting and useful accessories, but if you can only choose one, today we’re going to help you pick. Our criteria: versatility and value! You really can’t go wrong with the not-so-humble trampoline Ladder accessory. For a Vuly2 and Classic trampoline, a lightweight and non-slip Ladder is probably the most value-adding accessory that you can get! It makes hopping on and off your trampoline easy for the little ones, and you won’t hear nearly as many calls for help to climb aboard anymore. Vuly’s Ladder is easy click onto the frame and take away when you want to restrict access to the trampoline. It’s also finished in black with rust-resistant paint, which means it’ll not only last, but it’ll match your Vuly2 as well. For pure fun, it’s hard to go past a trampoline classic: our Basketball Set accessory! The Basketball Set is a longtime favourite of ours purely because it doesn't just add to your trampoline—it transforms it. Attach a Basketball Set, and suddenly you have a competitive little sports arena that’s bouncy to boot. Vuly’s Basketball Set is countless hours of safe entertainment that also enhances hand-eye coordination and balance. It might also be the doorway that leads to the brand new sporting hobby that gets the kids out of the house! UV rays can be a huge concern when spending time on your trampoline, but the fun Shade Cover accessory can make all those hours playing HexVex™ games a little more sun safe. Just slip on your Shade Cover when you want to block out much of the sunlight, but still want the maximum breeze to come through (which—let’s face it—is almost always). Vuly’s Shade Cover for Thunder Summer and Vuly2 is the accessory for lazy, sunny days spent in the backyard or a cool night of camping. With a little more light through the top and open walls for air, Shade Cover is the ideal all-purpose and year-round accessory. If you can only pick one, what accessory will you choose? 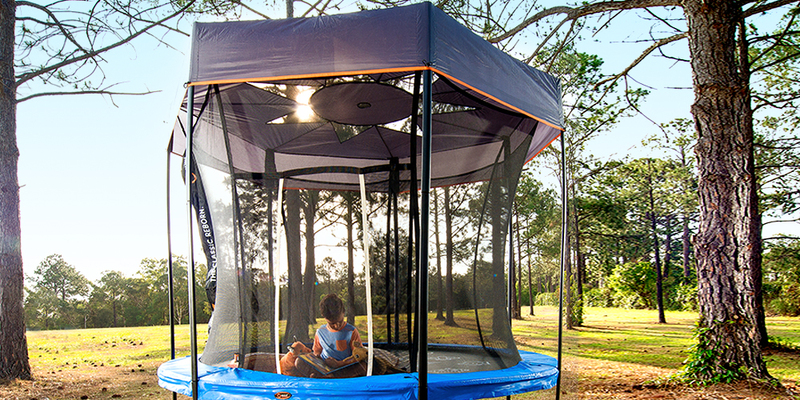 We’d love to hear what you think of as the most versatile and value-adding accessory for your trampoline!